SAEINDIA, a professional Society of Automotive Engineers, today announced the commencement of the 10th edition of the much awaited BAJA series. Mahindra & Mahindra is the title sponsor and the event is known as Mahindra presents BAJA SAEINDIA 2017. The redesigned virtual round of Mahindra presents BAJA SAEINDIA 2017 will be held from June 24th to 25th, 2016, at Christ University, Bengaluru. The teams have already started feeling the heat of this upcoming Mega Event which is due to be held in the IT capital of India, Bengaluru. With around 413 teams from various engineering colleges of India, 5 students from each team totalling over 2000 students, the battlefield is set and ready for these student warriors to battle out their ideas. In this two days event, the registered teams will be scrutinized for their knowledge and capability to participate successfully in the main event. Like last year, all the teams at the Virtual BAJA 2016 will have to make a presentation on their design, followed by an online test, which will carry equal weightage in their final selection. The evaluation process will test every participant’s knowledge on Rulebook and General Mechanical and Automotive Engineering questions. Based on the performance in Virtual BAJA, the teams would be selected for participation in the main event to be held in NATRiP, Pithampur near Indore. BAJA SAE Series® is an event for the undergraduate engineering students, organized globally by the Society of Automotive Engineers, USA. The event spread like a wildfire since its inception in the year 1976 and broaden its horizon in the countries like USA, Mexico, South Africa, Korea, Brazil & India. In India, the BAJA SAEINDIA (Society of Automotive Engineers) began its journey in the year 2007 and was launched under the leadership of Dr. Pawan Goenka (during his tenure as SAEINDIA President) and the convenorship of Dr. K.C. Vora. As SAEINDIA ventured on to the unchartered territory of holding a mega-event of this scale, NATRiP came forward to lend a helping hand through an earmarked zone at its upcoming proving grounds- NATRAX, situated at Pithampur , Indore. BAJA SAEINDIA tasks the students to conceptualize design, build, test & validate a single-seater four wheeled All-Terrain Vehicle (ATV) to take part in series of events spread across a course of 3 days. The finale will be held at the NATRIP facility at Pithampur near Indore, from 15th to 19th February 2017 followed by HR meet on 20th & 21st February 2017. A remarkable feature unique to BAJA SAEINDIA is the adoption of a new theme every year. This year the theme for BAJA 2017 is ‘Decade of Dream Dare & Drive’, which celebrates 10 glorious years of BAJA SAEINDIA. 10 years of students Dreaming to do things by applying alternative thinking, Daring to turn their Dreams into a reality by accepting no limits and Driving a positive change towards a brighter future. Mahindra is delighted to be associated with BAJA SAEINDIA 2017 as the title sponsor. With BAJA, we are taking forward the philosophy of Mahindra Rise to the next level. Year on year there has been an increase in participation from colleges. This is testimony to BAJA SAEINDIA’s growing popularity and its national significance. We at Mahindra believe the future belongs to those who believe in the power of their dreams. 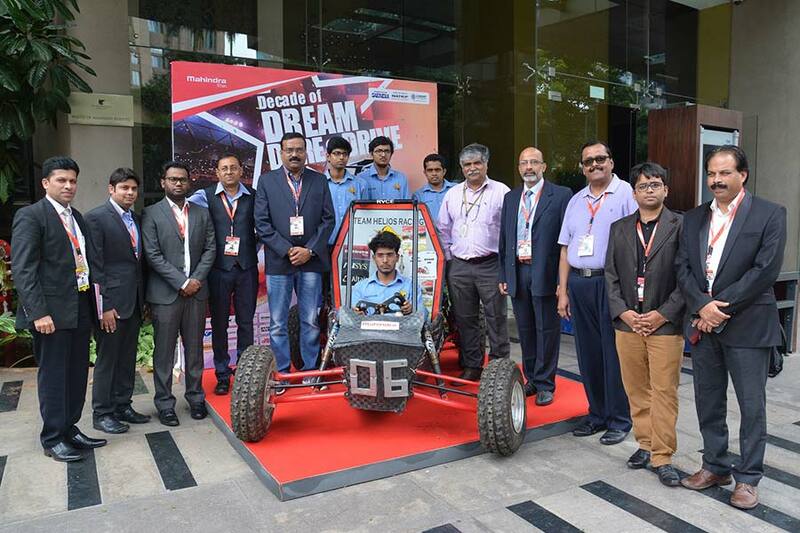 As we celebrate a Decade of Dreams, I am glad that BAJA SAEINDIA has been a forum that gives young engineering talent the platform to turn those dreams into a reality. Virtual BAJA 2016 is a unique event which is one of its kind among all the BAJA events that happen across the world. From last few years, we have seen a participation of around 300 to 400 teams from all over the country for BAJA and this number keeps increasing year after year. Unlike other global events, which works on “first come first serve” basis, BAJA SAEINDIA didn’t want to take away the learning opportunity ‎ for the students just because they were late to register. After several discussions, we introduced the Virtual BAJA round which gives a common platform to all the participating teams to present their design virtually. Only after a team has proven its worth through its design, it is given a clearance to make & run the vehicle at BAJA SAEINDIA main event. The virtual event has now reached new peak with 413 teams participating this season and the competition is fierce than ever. This event gives the students an opportunity to design a car, gain new skills and experiences which will definitely aid them in their engineering career. BAJA SAEINDIA initiated eBAJA from the year 2015 and this year around 48 teams have applied to participate for the same. Each team will be allotted INR 2 Lakhs for the vehicle from BAJA budget through various sponsors. To make the event more professional, a team of organizing committee members visited BAAJ SAE at Rochester Institute of Technology, USA where 6 teams from India participated successfully including RV College of Engineering, Bengaluru. This competition ‘BAJA’ will not only expose our students to various automotive giants who can enhance their knowledge in the automobile field, but will also imbibe in them a sense of hard work, team spirit and leadership. The students will be motivated to be the best amongst some of the finest teams in India and create a niche for themselves. BAJA serves as a platform for young engineering talent to showcase their skills and acquire a real life experience while overcoming obstacle and challenges.